This knowledgebase covers the process of registering on the support site. 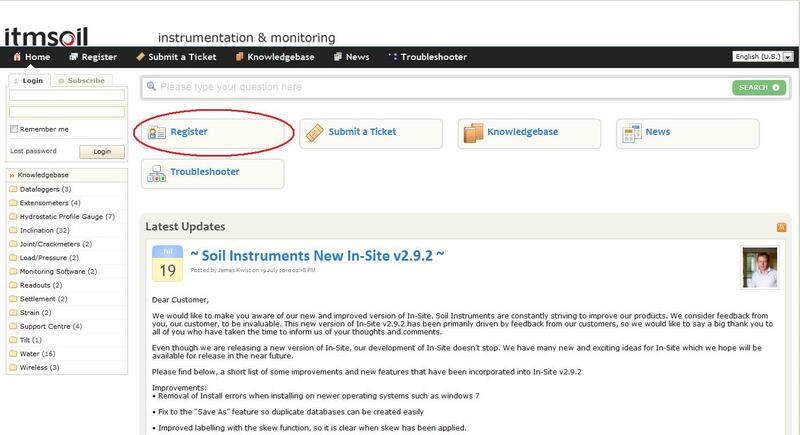 This gives users access to managing their existing support tickets for technical support issues or returning instruments for servicing. Step 1: To register on the support centre please go to www.soilsupport.co.uk (See Figure 1). Step 2: From either, the black navigation bar or main page, select “Register” (See Figure 2). Step 3: On the following screen, please fill out all fields available. Once complete press the “Sign Up” button at the bottom (See Figure 3.). Step 5: Once the validation link has been followed, you will be presented with a Registration Successful page. You will also receive a confirmation e-mail containing all your details. Your registration on the support centre is complete, you will now be able to login to the support site using your registered details. If you have any further queries, please call Soil Instruments on +44 01825 765044 for advice.